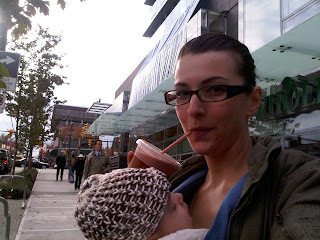 E and me, looking super sleepy...getting out for a walk and a smoothie. Carrying a baby sure adds an extra punch to your afternoon stroll! Well...here it is. The last of my losing it posts. I can hardly believe it actually. E is 4 1/2 months old and I have actually lost the baby weight. I feel a little apologetic about it actually. Because despite my trials and tribulations, the weight came off pretty quickly. Pregnancy has definitely made a permanent shift to my body (Can I keep the chest?? Please?) but I have achieved my goal of getting down to my pre-baby weight. I was a healthy weight before getting pregnant. Not in the best shape at the time but not a complete couch potato and I was a healthy weight for my height before getting pregnant. I always tended to go through cycles of working out and not but I have been active for a decade. So if you are thinking of getting pregnant and aren't at your healthiest, now is the time to get into the gym and get that heart pumping. Important Note: if you are already pregnant, do not try to lose weight or avoid weight gain as it can put you and your baby at risk. I was a healthy eater before, during and after pregnancy. I like fruits and vegetables and eat them regularly as the foundation, not the accompaniment, of my meals. I eat beans and whole grains like quinoa and barley daily. I don't eat white bread, pastries or junk food or drink pop. I did eat a lot when I was pregnant...and more Sour Patch Kids and Haagen Dazs than I care to admit. But after giving birth, I went right back to healthy eating. Not a diet - I ate well to help me heal and nourish my little one. I worked out as soon as I was able. I worked out 1-2 times per week when I was pregnant and as soon as I had the okay, I got back to working out 3-4 days a week. I credit the Tracy Anderson Method big time for being so freaking effective at reshaping my body. I am not an expert on this but I have a feeling that if I waited until 6 months to start working out it would have been ten times as hard to lose the weight. After giving birth, your body is still going through a lot of changes and I feel that working out during this time harnessed the capacity for change for good. Very unscientific but that is how it felt to me. In addition, breastfeeding takes a lot of energy so the combination of breastfeeding and moderate exercise allowed me not to have to reduce calories. I was able simply to focus on healthful eating. Important Note: Talk to your doctor if you want to start exercising while pregnant and you weren't active before pregnancy. Generally speaking, whatever you did for a work out before getting pregnant you can continue in pregnancy until your body tells you otherwise. I tried a supportive girdle. I am a bit embarrassed to admit this but I bought the ShrinkXHips. I remember when I was first pregnant and saw an ad for ShrinkXHips and was so indignant. "You just had a baby and the first thing you care about is your freaking hips?" I declared smugly. Then none of my pants fit at three months pregnant and I thought...that ShrinkXHips is looking kind of good. So I used it. Not constantly. I found that sleeping in it was easier than sitting in it all day because it shifted a lot. Did it help? I don't know for sure but my hips are back to their starting measurement. It would have been easier to determine if it didn't work...but it is harder to be sure it did. Do you have any tips and tricks you used for weight loss post-baby? Let me know! Congratulations, Desiree! You look great (not that you didn't look great before, obviously). I think E would be proud that he has such a go-getter of a mom!